Mowla Boksh, a legend of the Lalon Phokir gharana, breathed his last on 16 August 2012. May the Lord rest him in peace. We don’t realise what we got until it’s gone. Mowla’s departure reminded me of this once again. I started remembering his unique craziness, his humour, his incomparable style of musical mastery, and how passionately he was constantly celebrating every moment. I started to miss him. 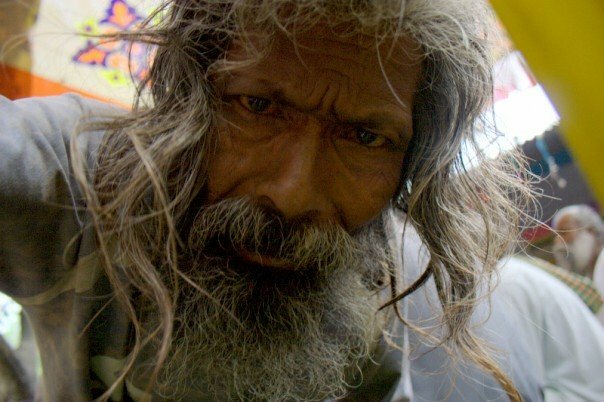 I searched for a photo I took of him 5 years ago, at a sadhu shongo at Abdur Rob Phokir’s Jyaotidham. Rob Phokir too is no more. I remember sitting on the ground at this shongo, near the stage with camera in hand, when Mowla noticed me and came towards me, bent down and looked straight through the lens. I can’t remember clearly, but I think I wasn’t even looking through the viewfinder when I clicked this. Sadhu guru masters held Mowla in a high place, he had their respect. Yet a madman. A master. Many accompanying musicians had a tough time keeping up with him when he sang. He was strict with them. He would give a harsh scolding whenever there was any mistake, if someone missed a beat or went out of tune. If anyone ever interrupted Mowla, that’s it, they would get a lesson in profanity, a full swing of pure Bangla vocabulary. Haha. I think many will remember him for that too. Always filled with great energy, every moment spent with Mowla was amusing. Spending time with him was like being on a roller coaster ride. One moment he’d crack you up with things he said or did, the next moment he might be swearing at you, maybe followed by another where he mesmerises you with a tune. Another noticeable characteristic about Mowla was his fashion consciousness. Most people may have thought him to be a vagrant, but Mowla was constantly designing his own outfits, changing clothes frequently. Sometimes a leather jacket, with pants he made from jute. He’d flaunt a motorbike helmet every now and then. He loved belts and shoes too. Only the Lord Almighty, and Mowla himself, know where he collected these articles and accessories from. In this video he’s wearing a t-shirt that says on the back “Apnar Shontanke Schoole Pathan” (Send Your Children To School), a popular slogan from a campaign to educate the nation. I was feeling regret that we never recorded Mowla Boksh’s singing. Then I remembered that I had used my compact camera to capture some video last year. I found the clip, and tears rolled down as I began viewing it. I did not feel like editing or touching up. So here it is, the raw clip. Only thing I did was resize the file, to ease uploading. It was recorded at Pangsha, Rajbari, at a sadhu shongo that was arranged to tackle attacks on phokirs/fakirs by religious extremists. YOU ARE REQUESTED TO PLAY THIS VIDEO AT THE EARLY HOURS, AT DAWN, WHEN IT TURNS FROM DARK TO DAYLIGHT. THANK YOU. Here Mowla Boksh is in his typical spirit, with unique rendition of Goshter Gaan. Right before first light, he starts the first song in his own style, finishes and starts the second song without any pause in between, which was a characteristic quite typical of him. He does the same with the third one. I am yet to identify the third song though. Lord Krishna as a young boy used to take cattle to the fields/forest to graze. Typically a cowherds-boy starts his day very early, when it’s still dark, taking the cattle out at first light. This time of day is also special for sadhu phokir/fakirs. It is celebrated with a series of songs depicting the experiences of Lord Krishna, like episodes that takes place at dawn. They begin with herds-boys, companions of Krishna, summoning him to wake up and prepare for the day. Krishna responds with a lament that he won’t go out with these boys who bully him in the forest. Ma Joshoda demands to know why such pain is caused, and the other boys respond. And it goes on until Lord Krishna is lost in the forest and ends up in Brindaban.